Line the bottom of a baking tray or casserole dish with parchment paper. Place your brown sugar and butter in a saucepan over medium heat and melt. Cook for 2 minutes after they have melted, until the mixture reaches a caramel color. You can use a candy thermometer if it makes you more confident but it is not required. While the butter-sugar mixture is caramelizing, lay down an even layer of pretzels in your baking pan. Pour the sticky butter-sugar mixture over the pretzels and smooth with an offset spatula. Sprinkle the white chocolate chips over the caramel-pretzel layer and place in the oven for 4 minutes. Remove the baking pan from the oven and use a clean offset spatula to smooth the chocolate. The white chocolate may still look unmelted but remove it and try to smooth it - it may spread easily. If not, heat for an additional minute until spreadable. While the chocolate is still melted, sprinkle on your M&Ms before placing the baking pan in the fridge. After an hour, you can break up the candy and serve! 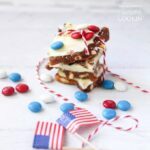 This recipe for 4th of July M&M Bark was printed from AmandasCookin.com - https://amandascookin.com/patriotic-candy-bark/ and can only be printed for education or personal use.